Thomas L. O'Brien Jr of Winthrop MA 1929-2013 Lieutenant during the Korean War, in the US Navy. 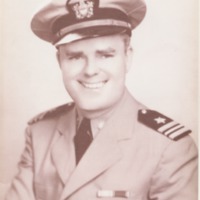 Description: Tom O'Brien while serving in the US Navy. John Cimino, US Navy Veteran of WWII. John served in the Navy from 1944- 1946, and was a member of the AM-VETS Winthrop Post 48. Description: John Cimino in front of his Barber Shop on Shirley Street, Winthrop, MA. 2016. John passed away on January 16, 2019. Description: Mazzuchelli served in the US Army from 1979 to 2000, both active and reserves. 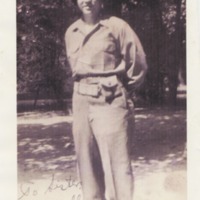 Joseph J. Melchionda, Jr shares a military photo of his Dad with us. Library staff member Alyssa True is ready to scan the photo. 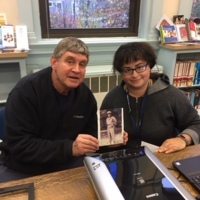 Description: Mr. Melchionda contributing a photo to the Library's Military Memories project. "Hello Mom & Sisters": !